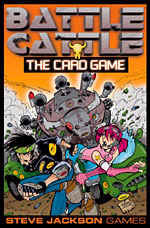 Battle Cattle, the hilarious game of cow-to-cow combat, is now a card game. America's finest beefsteak puts on armor, grabs the big guns, and goes at it hoof and horn. It includes six full-color cow cards, 110 full-color playing cards, and short, easy rules. Fast, fun, quick to learn . . . and your foes are hamburger. This game is a lot of fun. It is almost a duplicate of another game made by Steve Jackson, by the name of "Car Wars: the Card Game". In fact, the games are so similar that Steve Jackson decided to make them bindable. So, if you own both decks, they mesh together as a cow versus car battle royale! (dont ask me *shrug*) Let me begin by describing "Car Wars: the Card Game", so I have a basis of comparison. In "Car Wars: the Card Game", you could fire missles, machine guns, auto cannons, flamethrowers, and all types of weapons at another car, trying to peneterate a side of their armor to be able to take a shot at the driver's body. In "Battle Cattle", there is a "Methane" body shot card which passes gas on your opponent for a body shot of 3 damage (graphical representation shows an image of a cow with a green hue encompassing it). Both games are a riot and I would highly suggest this one, especially if you already own "Car Wars: the card game".